We have more than alpacas here at the ranch. 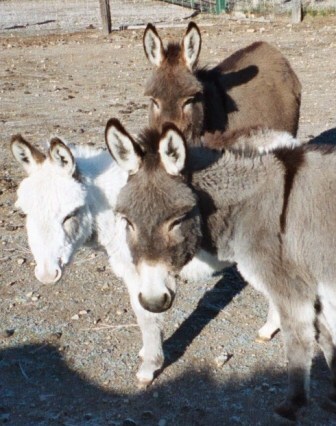 The first critters who announce time for morning feeding are the minidonkeys, Linda, Ginger and little Stormy. They are loud for such short creatures! Then the blue tick hounds have to join in- they want to make sure we hear the donkeys!?? 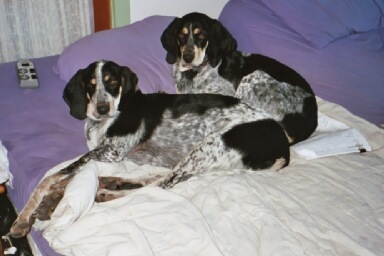 Blue is the goofy one in the front, Ellie Mae is his sister. So, they are serenading, which wakes up the mini-pigs. Merle and Pearl, whose first order of business is to check to make SURE that all cupboards and the fridge are securely closed. They are very thorough- And yes, they sleep in the house, and use the dog door.